Creating a decorative light switch cover can make a room a little more cheery and fun. Kids love this idea, and displaying their favorite superhero, animal or cartoon character is a great way of brightening up their rooms. Making a customized light switch cover is easily accomplished using a paper print-out of any picture or design you like, which can then be adhered to the light switch. The excess paper will need to be trimmed away and a hole will need to be cut out for the switch itself. Print a 3-by-5 inch picture of your choice. The picture should be in portrait format, because light switch plates are longer than they are wide. Cut the picture out using your scissors. 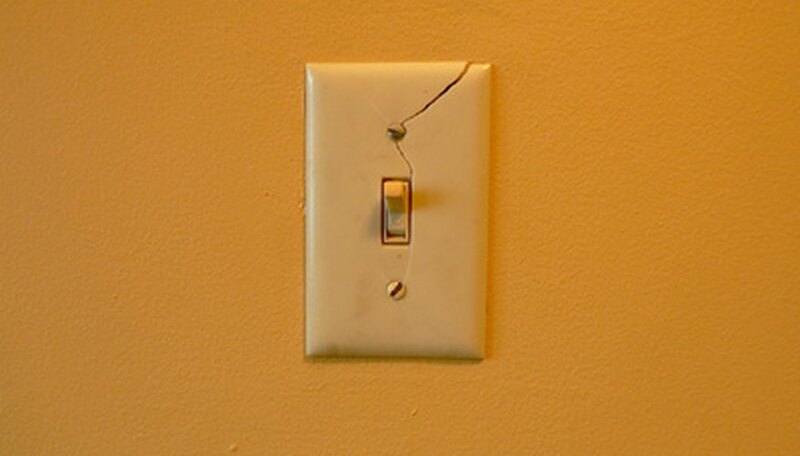 Remove your current light switch cover by unscrewing the two flat-head screws above and below the switch. Align the printout onto the light switch cover and wrap it around the edges. Using your scissors, trim off any excess paper around the edges. Doing this before applying adhesive is less messy. Remove the picture and spray the back with an adhesive. Re-align the picture on the light switch and press it into place. Wrap the image around the edges of the light switch for a neat and uniform appearance. Lay the light switch face-down on a thick scrap piece of newspaper or on a cutting board. Using the edges of the center switch hole as a guide, use the utility knife to cut out the center hole. Push the picture edges around the center hole firmly into place. Re-install the light switch cover by placing it over the switch and pushing the screws gently through the paper into the holes underneath. Screw in the two small flat-head screws.